The controversial modern-style and example of the Bauhaus architecture residence of Constantinos Parthenis (1878–1967), one of the most prominent Greek painters of the 20th century, stands out on the junction of 40 Rovertou Galli and Dionysiou Areopagitou Streets, right beneath the Acropolis. Its erection in 1924 signals the first violation of the archaeological landscape at the eastern side of the Hills. The decision for demolishing the house is taken within the scope of the area’s reformation, a project which is however aborted when the painter threatens to blow himself up along with his paintings. Eventually, the house is demolished soon after his death. Biris 1966, 394; Eleftheria newspaper, 28/01/1967. 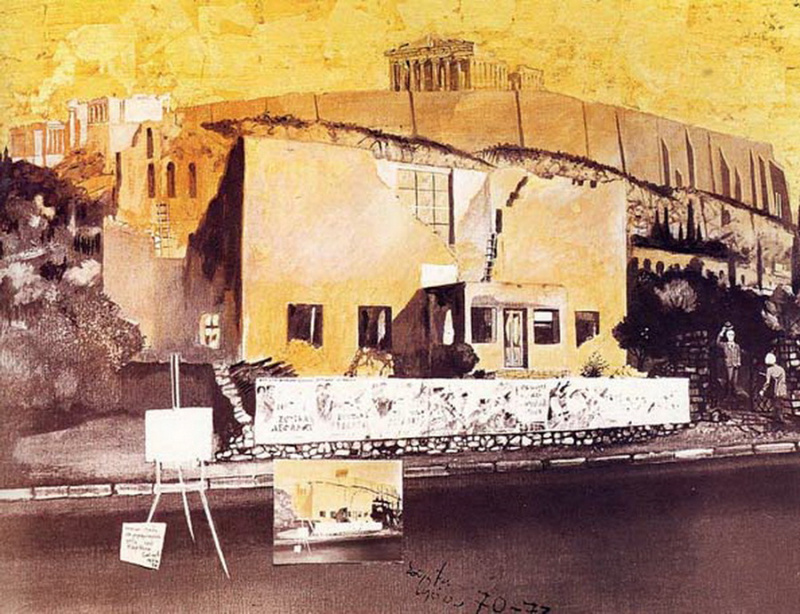 The residence–workshop of the painter Constantinos Parthenis on Dionysiou Areopagitou street is captured in a painting by Spyros Vassiliou, entitled “A Tribute Visit to the Ruined House of Parthenis”, 1970–73.